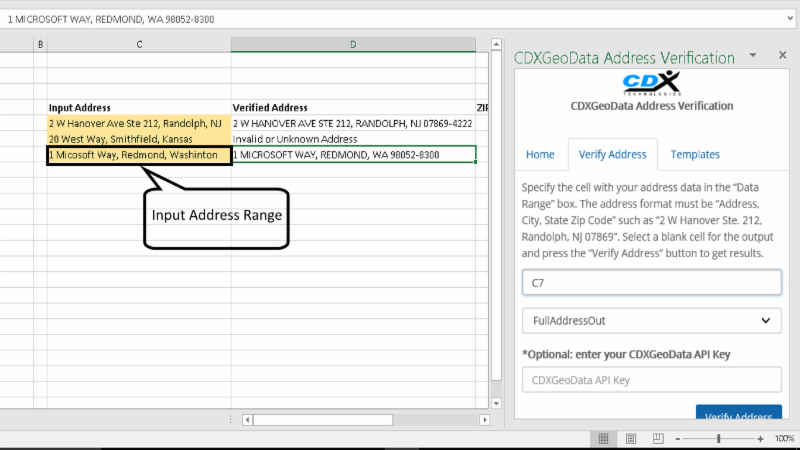 We've introduced a CDXGeoData Address Verification app that is now available for download in the Microsoft Office Store. This app will also work on Apple iOS systems. We also announce the end of support for CDXZipStream on the Windows XP operating system. This add-in will allow you to verify and correct U.S. postal addresses. It will output a USPS standardized address along with ZIP+4 data. The available report fields include the corrected full address, ZIP Code, ZIP+4 Code, congressional district, county and more. Links are also provided to our Excel templates which support bulk address requests, distance calculations, radius analysis, demographics and more for desktop versions of Excel with VBA. This demonstrates that we can move our technology to new platforms such as the Mac, online versions of Excel and Apple iOS. We can also develop custom apps that include Bing driving distance and geocoding functions which can be widely distributed to your workforce on these platforms without user licensing fees. We will be ending our support of CDXZipStream on Windows XP operating systems on December 31, 2017. Support of Windows XP by Microsoft was discontinued in April 2014. We've been continuing to support XP since it is the third most popular operating system still being used on about 7% of PC's. We urge you to migrate from Windows XP as soon as possible, not because of CDXZipStream but due to major security flaws in that operating system. These vulnerabilities led to the WannaCry virus. We will be upgrading CDXZipStream in 2018 to support Office 2019 in a new Microsoft framework that does not work on XP. If you have our current version or classic product installed it will continue to work and your license to use it will not expire. But this new version of CDXZipStream will not run or be supported on Windows XP. CDXZipStream will still work with all operating systems later than Windows 7. Also, as a reminder in last month's newsletter we announced that we will also be ending our support for the classic version of CDXZipStream at the end of this year. Canadian and U.S. data feeds of CDXZipStream were updated as of October 25. There were 157 changes made to the U.S. database this month. If you would like to update your database to reflect these changes, select the "Account" option on the CDXZipStream commandbar and click on "Check for Available Database Updates". You can then update each database as required. CDXZipStream updates are a part of the one-year software maintenance subscription included with your purchase. If you would like to extend your subscription, please sign in to the CDX Technologies website and from the account area for CDXZipStream, select "Buy Data Update".